Cycling burns serious calories (400-600 in one session)! Cycling strengthens quads, gluteus, hamstrings & calves — a whole-leg workout! There’s a limited amount of joint impact in cycling. Cycling is safe for all healthy participants. Feel free, as the rider, to be in command of your cycling experience. You can increase or decrease the intensity of your ride by changing your resistance level, speed or position. Make your ride what you need no matter what class you choose. Cycling classes are on a first come first serve basis. Class participation fee is payable at the Member Service Desk. You will receive a cycle class receipt. You will need your receipt for admittance into the Cycle Studio. If you need to cancel, please do so at least 2 hours prior to class in order to be refunded. 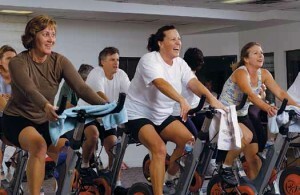 Frequent cyclers also need to cancel 2 hours prior to the class or will be charged $2.00. Registration opens day of class. Attention first time cycling members! Please arrive at the Cycling Studio 10 minutes before class time for bike preparation instruction. Enjoy unlimited cycle classes for only $12.00 per month. Monthly payments are made through bank draft or you may pay in full for the year. This allows you the privilege to call 8 p.m. the day before class to register. Please remember to follow the current cycle class receipt procedures. Stop by the Member Service Desk and sign up today! This energizing class is a great combination of a traditional cycle class with the addition of the cardio and weight training in a boot camp class. No registration or fee for this class.